A few years back I’ve read The Goal. It was quite late in my agile life, so it wasn’t that eye opener everybody was talking about. It made sense, because I could compare my experience with software projects with the process of learning described in the book. Still, the book was about manufacturing. So I still needed to translate things. For example, inventory in the plant occupied space. It was visible, and people had to walk around it. In knowledge work that doesn’t happen. . We feel the effect of multiple tasks-in-process, where none of them finish, but we don’t just see them. Instead, we need to visualize and track tickets to see WIP and how they exceed their limit. Another thing is the inventory occupying the space actually costs the plant money, where in knowledge work we need to attach proxies to that cost. Then, we need to understand how each task not ending impacts value delivery. Knowledge WIP costs are not visible. I assume that from a beginner’s point of view, the ideas of The Goal needs some leap of faith (and learning) in order to fully understand it. 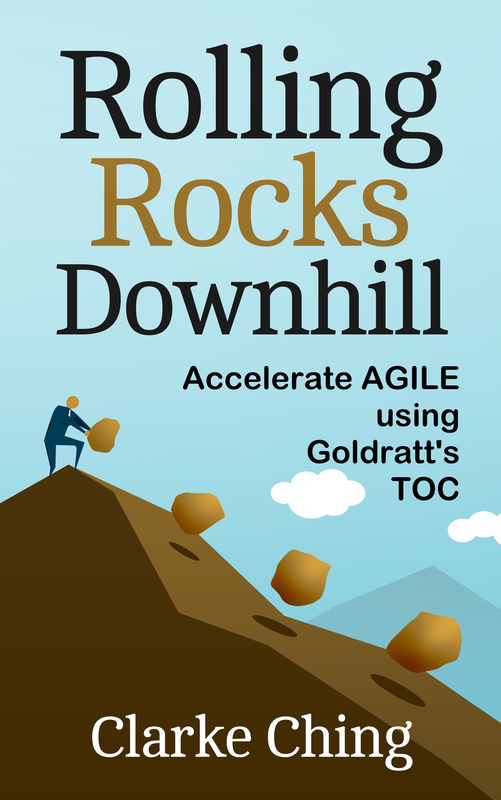 “Rolling Rocks Downhill” starts in the software world, and explains many of the ideas described in The Goal in knowledge work terms. As I was reading the first few chapters, I was thinking “It’s just like in The Goal”. As the book progressed it went beyond the basic ideas in The Goal towards ideas of focus, reducing scope, team collaboration and continuous learning. Finally I tweeted that my neck hurt from too much nodding in agreement. I could relate directly to the plot. The book describes many experiences I’ve gone through in the past, and also now, as I try to help teams overcome the same kind of problems. The book creates an unwinnable problem for the protagonist, and then opens his eyes to different “common sense” insights. Once he’s learned, there are two things he needs to do: Decide and execute. Decisions which require courage, but after they are taken, make it possible to succeed. Common sense is not not that common though. Courage is not that easy to get by. The book shows you that these two combined make for a winning card in an unwinnable scenario. When I finished the book, it felt a bit short. I wanted more. More experiences, more experiments. Things that I’ve already learned, and things to learn from. For me – that’s a hell of a book. If you’re just starting on your path to agile. Or your project is plainly in trouble. Or even if you’re looking for inspiration. Clarke Ching – Thanks for the neck ache! It was worth it!